Fractures of the collar bone are generally treated without surgery. If however the fracture is displaced, broken into many pieces, tenting the skin, the outer end of the collar bone they may not join or may join with considerable deformity. To avoid complications of the fracture not healing or healing with considerable deformity plating of the collar bone may be necessary. Each fracture needs to be assessed on its own merits. A few examples can be seen in the gallery. The surgery is best discussed in detail with Mr Rao. 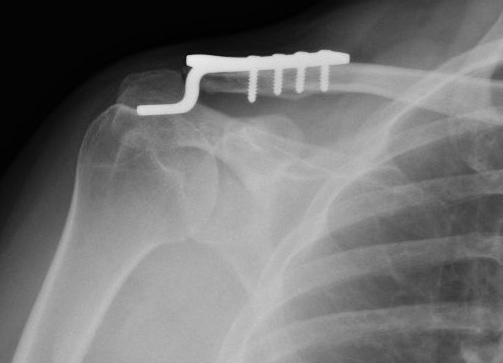 Very displaced grade 3 and higher injury of the AC Joint require surgery to restore the anatomy to normal, improve shoulder function and to get a very pleasing cosmetic result. I prefer the Hook plate (below) as it is reliable but has to be removed after 3-6 months to ensure return of normal function. Late presentations require additional reconstruction of the CC ligament by other techniques.